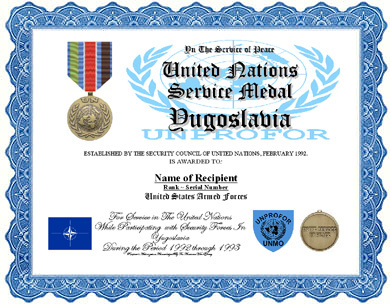 An unaltered photocopy of your DD-214 or other military issued document clearly displaying your award of the United Nations Service Medal for service in Yugoslavia. Ribbon: UN blue with a red central stripe which has narrow white edges, and one green and one brown stripe. UNPROFOR was established in February 1992 as an interim arrangement to create the conditions of peace and security required for the negotiation of an overall settlement of the Yugoslavian crisis. The role of the UN troops was to ensure that areas designated as "UN Protected Areas" (UNPA) became and remained demilitarized and that all persons residing in these areas were protected from fear of armed attack. The role of UN police monitors was to ensure that local police forces carried out their duties without discriminating against persons of any nationality or abusing any human rights. The force also assisted the humanitarian agencies of the UN in the return of all displaced persons who so desired. There were several extensions of the original UNPROFOR covering the following purposes: reopening of the Sarajevo airport for humanitarian purposes; establishing a security zone encompassing Sarajevo and its airport; protection of convoys of released detainees in Bosnia and Herzegovina as requested by the International Committee of the Red Cross; monitoring arrangements for the complete withdrawal of the Yugoslavian Army from Croatia; the demilitarization of the Prevlaka peninsula and the removal of heavy weapons from neighbouring areas of Croatia and Montenegro (Res 779,1992); monitoring compliance with the ban on military flights (Res 781,1992); and the establishment of the United Nations presence in the former Yugoslav Republic of Macedonia. UNPROFOR also monitored the implementation of a cease-fire agreement requested by theBosnian Government and Bosnian-Croat Forces in February 1994. In addition, UNPROFOR monitored cease-fire arrangements, negotiated between the Bosnian Government and Bosnian Serb forces, which became effective on 1 January 1995. On 31 March 1995, the Security Council decided to restructure UNPROFOR, replacing it with three separate but interrelated peacekeeping operations: UNCRO (United Nations Confidence Restoration Operation in Croatia), UNPREDEP (United Nations Preventive Deployment Force) under the joint theater headquarters known as UNPF (United Nations Peace Forces) located in Zagreb. Eventually, following positive developments in the former Yugoslavia and the establishment of two new United Nations Missions in Bosnia -Herzegovina and Croatia, UNPF-HQ was phased out in January 1996. The colour combination of the ribbon for the medals and bars consists of a background of UN blue, with a central wide band of red, representing the United Nations Protected Areas (UNPAs), flanked by thin stripes of the white. On the left side there is a narrow band of green, representing forests, and on the right side, a narrow band of brown, representing the mountains. Ninety days of qualifying time is required for the award. The countries of Argentina, Australia, Bangladesh, Belgium, Brazil, Canada, Colombia, Czechoslovakia, Denmark, Egypt, Finland, France, Ghana, India, Indonesia, Ireland, the Hashemite Kingdom of Jordan, Kenya, Luxembourg, Malaysia, Nepal, the Kingdom of the Netherlands, New Zealand, Nigeria, Norway, Pakistan, Poland, Portugal, the Russian Federation, Spain, Sweden, Switzerland, Tunisia, Turkey, the United Kingdom of Great Britain and Northern Ireland, the United States of America, Venezuela and Ukraine provided troops or observers to this Mission. Mission began: February 1992. Mission ended: January 1996. Awarded: for 90 days' service in the Mission, establishing and maintaining demilitarised areas and ceasefires within the former Yugoslavia.